Detained in Dubai for more than two months in the United Arab Emirates faces up to seven years in prison for stealing police handcuffs, an allegation he says he only confessed to after being tortured. A judge in Dubai is expected to hand down a verdict next week against Adam Foster, 30, of Burdett, New York, whose case has become the focal point of a grassroots letter-writing campaign via Facebook that calls for his release. The UAE has charged Foster with theft of government property, possession of police paraphernalia and theft at night. If found guilty, he faces up to seven years in prison. The U.S. State Department confirmed that Foster was detained. American consular officers met him on February 28 before UAE authorities released him on bail March 1. Foster said he found the handcuffs a day earlier on the ground at a mall parking lot, about a mile and half from the police station where he was questioned. Foster, who was on his way home after a six-week stint as a contractor for Dubai Energy Water Authority, was arrested after authorities found the handcuffs in his luggage during a routine security screening at the Dubai airport. He said he was pulled off the plane, questioned and taken to a police station, where he was interrogated twice by two officers. It was during that second round of questioning, after hours of maintaining his innocence, he said he was beaten and forced to confess. Officials in the UAE did not respond to a CNN request for comment. This entry was posted on May 16, 2011 at 00:16	and is filed under Adam Foster Dubai, Detained in Dubai, Human Rights Dubai. 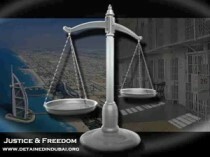 Tagged: Adam Foster detained in Dubai, Dubai Court, Dubai criminal law, Dubai Justice, Dubai Police, Dubai Prosecutor. You can follow any responses to this entry through the RSS 2.0 feed. Both comments and pings are currently closed.